In the 1830s, four sets of great-great-great grandparents, two paternal and two maternal converged along the western edge of Illinois along various points of the Mississippi River and eventually met up in Hancock County, across from that little, 30-mile jag in the southeast corner of the just-created Iowa Territory created as a result of militias facing off in the Honey War with Missouri. 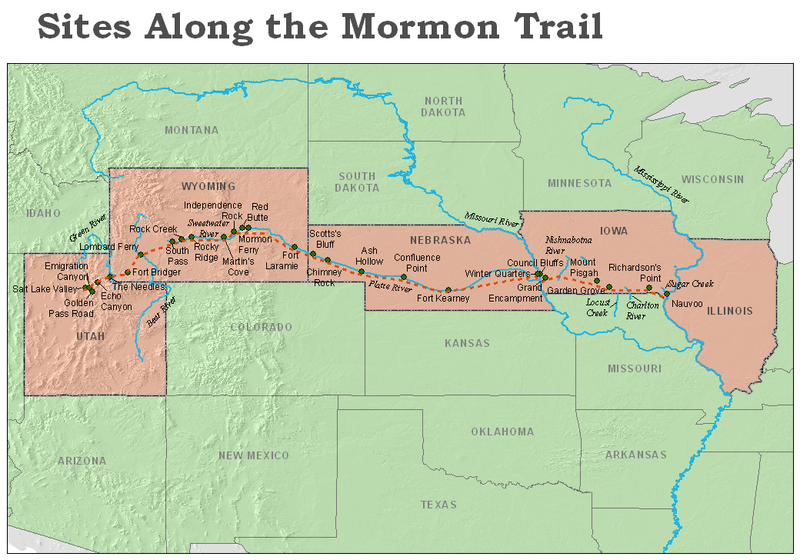 They had been drawn for different reasons to various parts of Illinois from their homes in south central Massachusetts, west central New York, south eastern Pennsylvania, and south central Virginia, but they and their families eventually all converged for the same reason in Hancock County, they had become among the several thousand people to join the 10-year-old Christian faith nicknamed Mormons. Although forefathers of these ancestors of mine had fought and often died for this country including causes such as the right to religious freedom, some as early as the conflicts of the late 1600s and many others in both the Revolutionary War and the War of 1812, these four families were soon forced by mobs to flee across the river on a four month slog across southern Iowa during a very wet and muddy Spring to Council Bluffs which overlooks the Missouri River and Nebraska where they were delayed a full year before continuing west into the safety of what was then Mexico. Charles Shumway had been the first among 3,000 to cross the Mississippi into Iowa and he and Charles Harper would be in the vanguard wagon train to the west and among the first few wagons into the valley of Salt Lake, serving together on a committee of three to make preparations for the others just less than a hundred years before two of heir descendants, my parents, would meet and marry. They were followed by Lewis Neeley three years later but ironically, my fourth ancestor, Sebert Shelton, who was born in an area of Virginia just an hour north of where I now live in Durham, North Carolina, took a more circuitous route. He was among 500 who volunteered at the ironic request of the American Army to fight in the war with Mexico and eventually with the rank of quartermaster sergeant, headed toward Santa Fe, taking his family with him. In further irony, he was later asked to help lead a detachment of sick soldiers to winter in Pueblo, CO, among Mormons who were wintering there on their way west from Mississippi. All would then venture north to the trail being blazed by the vanguard group including three of my ancestors, following them by just a week into the valley of the Salt Lake where in a final bit of irony, what was then Mexico would soon became part of America because of that war and eventually the territory and then state of Utah. Sebert Shelton’s name isn’t as prominent as my other ancestors among the first pioneers, possibly because within a year or two, he headed across Nevada, first into the California Gold Rush at El Dorado and then eventually settling in western Sonoma County, north of San Francisco, where he is buried near famed Highway 101. In another bit of irony, taking Northern California had been the mission given then Sargent Shelton’s Mormon Battalion by the President of the United States in the 1846 war with Mexico. On upcoming cross country trips to see family including my daughter and grandsons, I’ll be closely following the routes these ancestors took up and over the Continental Divide to what became my origins in the far reaches of the Teton-Yellowstone nook of Idaho. I'm researching Sebert Shelton of Pittsylvania County; I'd love to swap records if you have anything on his early (pre-1819) years!